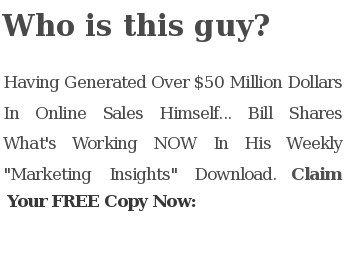 Bill's monthly guide revealing the latest profitable techniques in Internet marketing. Tonight’s Live Streaming Show: Can Social Media Sites Like Twitter Help Your Business? It seems sites like Twitter & FaceBook have been in the media almost daily. All the celebrities are piling on the social media bandwagon. You can find them all online using social networking sites. Even Oprah & Barbara Walters are on Twitter! The big question tonight is: Can these social media sites really help your business? Or is it all a bunch of hype? Find out on tonight’s show: http://www.billmcintosh.tv/live It’s a live streaming broadcast and it starts at 6:30PM Pacific Standard Time / 9:30PM Eastern. I’ll cover this topic & take your LIVE chat & phone questions. I’ll also be talking about the upcoming Mass Control Marketing Seminar this week in San Diego. I’d like to meet up with any of my viewers or blog readers while I’m down there. This entry was posted in Bill's Schedule and tagged increase website traffic, internet marketing, internet marketing seminar, internet marketing show, internet marketing tips, live broadcast, live show, live streaming, online marketing service, online marketing show, online marketing tips, Social Marketing, social media, social networking, twitter, ustream, video, Video Marketing, web site traffic by Bill McIntosh. Bookmark the permalink.